Broadway Hall is an elegant site for wedding ceremonies, receptions and more. Newly renovated, the hall is located in Bellingham, WA, 50 miles south of Vancouver, B.C., and 90 miles north of Seattle, WA. Broadway Hall is located on a bluff overlooking Squalicum Harbor and Bellingham Bay, which provides gorgeous sunset scenes and a view of the San Juan Islands. If you are searching for a wedding or reception venue, a ballroom for your party, or simply a unique meeting site, you must see Broadway Hall. Broadway Hall, noted for its unique arches, cozy nooks and elegant architectural design, boasts a character, charm and history. Built in 1905 by an elite women's social club in Bellingham, Broadway Hall is listed on the Washington State and National Historic Registers. You and your guests will be transported back to an era when good taste and lavish entertaining were an everyday event. The Fireplace Room on the main level is ideal for a wedding ceremony, anniversary, birthday party, or cocktail party.There is a full kitchen, equipped with two gas stoves, refrigerator, freezer, plenty of counter space and a bar pass through. The stage is perfect for a couple exchanging vows, and is also ideal for a DJ or band. A cozy gas fireplace greets you as you walk in and creates ambiance for any event. The Ballroom has gleaming wood floors and vaulted ceilings under which eight crystal chandeliers glow. The bay side windows allow for breathtaking sunset views that add elegance and ambience. A kitchenette is discreetly tucked away in one corner. The ballroom nicely holds about 280 guests, seated theater or banquet style. Broadway Hall is located near Elizabeth Park, Zuanich Point Park and Squalicum Harbor; all are excellent places for outdoor wedding photos. This storybook setting with unique architecture is ideal for any special event. 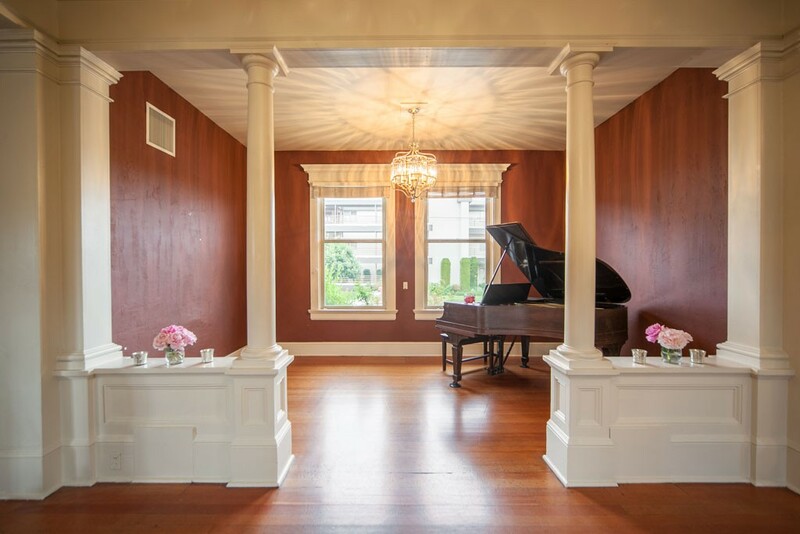 We are proud to offer this treasured and unforgettable venue in beautiful Whatcom County. Copyright ©2011 Broadway Hall. All Rights Reserved.